I reckon Sesame Street has been ‘doing’ Growth Mindsets for 40 years. Here’s their latest contribution to promoting the effort and being resilient. I have drawn together some ideas to form a first draft (very EoE) of a Pedagogical Model for Motivation, Growth Mindsets and Excellence. It also incorporates a Marginal Learning Gains approach as an integral part of developing Growth Mindsets for teachers and students alike. A design template for learning where we can truly wrap the curriculum around the pedagogy. 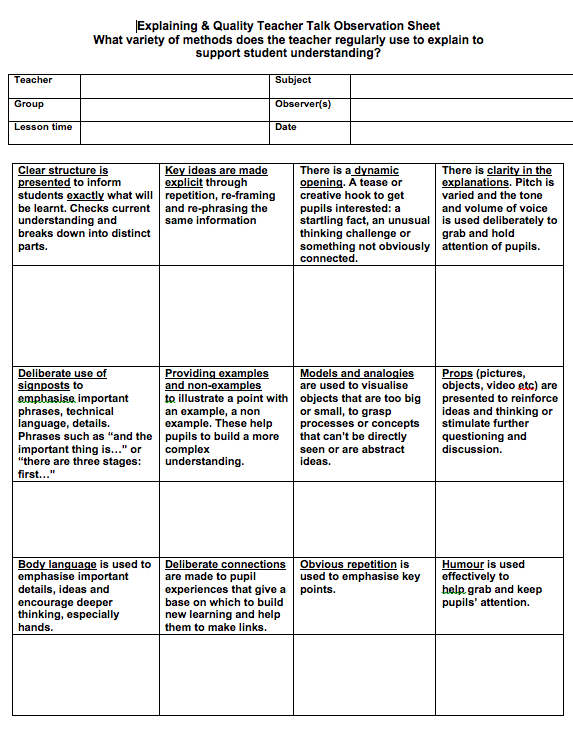 I’ve included a screen shot of an observation format I use very regularly for you to have a look at: ‘Explaining – Improving the Quality of Teacher Talk’ The original version plus others that I regularly use, adapt and tweak can be found in “Full On Learning”. You’ll notice that this is a very focused observation tool, as it ONLY looks at the quality of teacher talk in relation to EXPLAINING. Hence it can be used as part of a developmental coaching approach..which is just how I use it. I use this particular one as part of my pedagogical coaching toolkit. I’ve got others that focus on questioning and a more generic one that looks ONLY at ‘Pupil activity during the lesson’. They’re all developmental in design as they are limited by their focus on a very specific element of pedagogy. In practice, they work as a simple tally sheet during the lesson. You can add additional layers of complexity, according to what the teacher wants to focus on, but my watchword is and always has been to keep it SIMPLE when it comes to observing the complicated world of teaching and the similarly complex world of learning. 1. When you work with a group of teachers to create and amend the observation format you get into wonderful discussions and sharing of expertise. In fact, it’s at THIS point when you get the really crunchy discussions about ‘quality teacher talk’ and how various concepts can be explained and what else could be used to aid the communication of complexity, of topic fundamentals and of core concepts so that learner understanding is secure. 2. When used as part of a pedagogical coaching programme, the results can be put into a simple spreadsheet to generate a visual chart (Hans Rosling would be proud!). This then forms the basis of your coaching discussion, as it places the focus of the discussion on the teacher, enabling them to reflect and consider their own practice. 3. Coupled with a skilled coach possibly also with video, you get rewarded by by using this as part of a MARGINAL LEARNING GAINS approach and find that you get those sought-after MULTIPLE GAINS from one simple pedagogical focus. Every teacher at KEGS is involved in a teaching and learning group called a ‘workshop’. We meet several times across the year to explore a particular aspect of pedagogy. Teachers select who to work with and what to work on. In May each year we have a non-pupil day that we call a ‘Leading Edge’ day where we run a 90 minute marketplace-style showcase of the work we’ve all been doing in our groups. The 2012 Marketplace is reported here. The 2013 Marketplace is reported here. Daniel Pink’s talk at The RSA discusses how everybody today is involved in some form of selling. We all have to, at some point in our working lives, persuade other people to listen to us, to change the way they are doing things or get somebody else to allow us to do something different from what we may have originally been assigned to do. The art of persuasion is, Pink suggests, akin to the art of selling. Similarly, every day in every classroom, every educator is engaged in the gentle and not-so-gentle art of persuasion. Of ‘selling’ learning. From the first to the last bell, educators around the globe are engaged in this complex and necessarily sophisticated act. We operate in a world where goal of the educator is to constantly persuade learners to make a transaction. To give their attention to the lesson topic and to invest their time in doing something different from what they may ordinarily prefer to be doing. Teachers who manage this are rewarded by learners who are motivated enough to chose to invest their time and indulge their curiosity. To explore new and alternative ideas and, in doing so, build their resilience as they stick at the task in which they have been persuaded to engage. Day in, day out, hour upon hour, succeeding in this is no mean feat. After all, the task of educating learners out of their own immediate context and into the one that we are persuading them to try out requires us to have expert negotiation skills. We have to convince them that it is worth it for them to jump into the multifaceted world of learning. A world that is full of complexity and unfamiliarity and where for many of them, there is no certainly of success and only small crumbs of comfort in their pre-existing understanding. Just to make it even more perilous for them, this is a world where will be expected to trust their peers. Peers who themselves are either driven or held back by their very own unique uncertainties and fears. And that’s just the first lesson on any given Monday morning. Pink goes on to say that whilst we are all involved in some way shape or form in the act of persuasion or ‘selling’ as he refers to it, the art of selling (persuasion) itself has changed. We all know that it is vital to be aware of how the learner feels when we are teaching as we can use this to adapt lessons to accommodate emotional needs in order to sustain their cognitive development. This is just as true, according to Pink, in the context of selling. But, Pink goes on to say, research suggests that it is far more useful to be aware of what the buyer is THINKING. Pink says that to adapt our persuasive strategies according to what the buyer is thinking results in a far more sensitive and accommodating approach to how we chose to present our ideas and information. In the context of education, this resonates very strongly with what Hattie refers to as the need for teachers to be ‘error seekers’ (there’s more on this on the Marginal Learning Gains blog). This is where we ask not, ‘Who understands this?’ but instead, ask, ‘Who doesn’t understand this?’. This question is a double-impact question in that it produces benefits on two levels. At one level, it enables teachers to reveal the information they really need to make their teaching the most effective it can possibly be in promoting the best possible learning outcomes; ‘What do I need to do in order to re-frame or re-explain this concept/ idea/ process so that everyone can secure their understanding before I move onto the next topic/ concept/ idea?’. At the second level, it communicates an explicit culture of learning where it’s made crystal clear that it’s okay not to understand it the first, second or even third time. A culture where it is absolutely fine, if not expected, for learners to get it wrong, use this to feed their ‘mistake monsters’ and to struggle at times during the lesson. In his Ted Talk, Mark Ronson explains the process of creating his own music through sampling previous music recordings, “I can bully our existences into a shared event…I can insert myself in that narrative, or alter it, even.” He says that this has always been true of music, and that the explosion of technology has simply accelerated and democratised this over the past 30 years. The #NTENRED Conference last weekend hosted by Huntington School, York, was an example of what Ronson refers to as just such a ‘shared event’. Every one of the 200 who attended and every one of those who watched online, followed the tweets and who have since caught up with post-event blogs have been invited to ‘insert themselves in that narrative’ of the conference-conversation. They are all now in a position to decide how they might ‘alter it’ and decide how to build on and implement what they learnt. 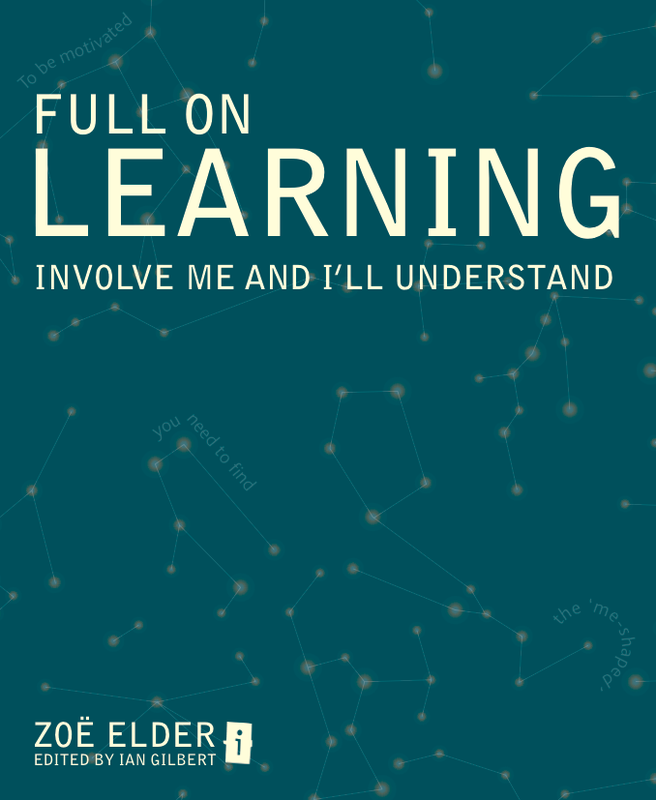 By increasing education practioners’ accessibility to and engagement with, the body of research about learning, there is a golden opportunity to integrate this with individual observations and insights in a balanced and measured way. In other words, practitioners can deliberately ‘sample’ the information they gather from external sources (the body of research) with the information from internal sources (their own practice and context). In doing so, practitioners are empowered to design learning that is directly informed by the existing body of research intertwined with the unique needs of their individual students. They can then tailor their design to their own specific contexts whilst remaining consistently clear and well-informed about the specific changes they want to bring about. The real creativity in teaching and learning happens when we weave our reflective practice into the rich understanding we can draw from our sampling and fusing of research and practice and in doing so, increase our profession’s collective consciousness. The ‘fresh and new’ that Ronson refers to is that unique mix of our own expertise, the uniqueness of our own learners and the specific context in which those elements find themselves in at any given moment in time.